This article originally appeared in BOOM California. 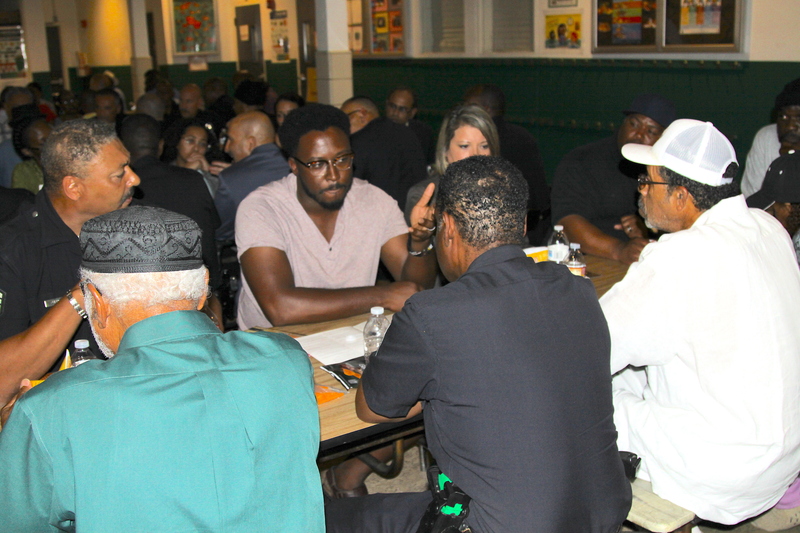 One of the men at the table was Khalid Shah, a veteran activist and organizer in South L.A.’s African-American Muslim community. He shook his head and his eyes clouded over as he relived the preventable event. “Why?” he wondered, his pain a bridge between past and present. 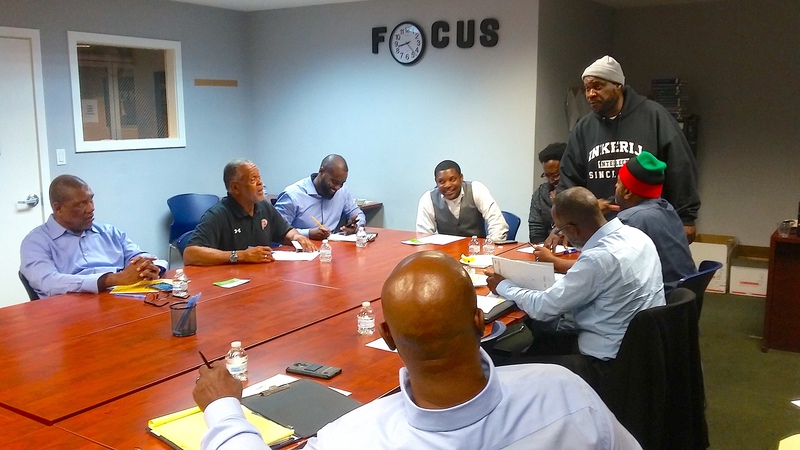 The community-development organization that Umar Hakim leads—Intellect, Love and Mercy (ILM) Foundation—convened the group to prepare for an upcoming public forum between African-American Muslims and the LAPD at Masjid Bilal Islamic Center in South Central. The meeting would be the first of its kind in recent memory between local law enforcement officers and the constituencies that Hakim and Shah represent. 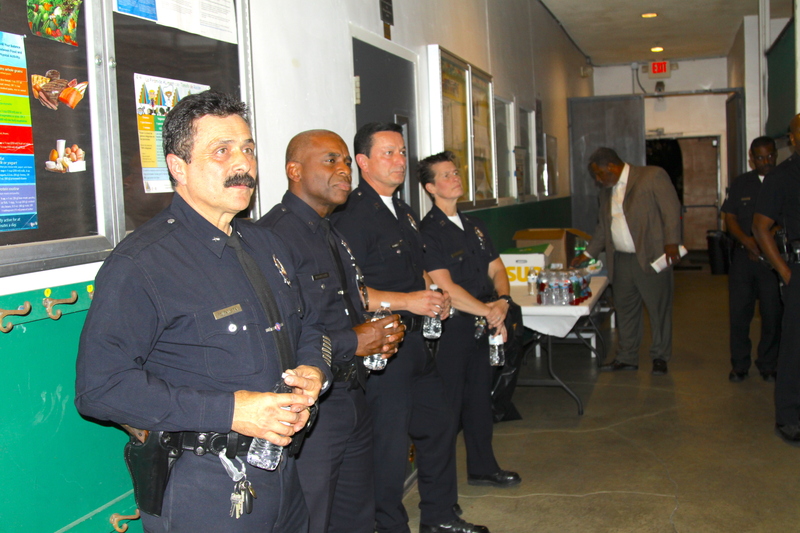 At a time when public officials often view both Muslims and African-Americans solely through the lenses of policing and security, the event at Masjid Bilal presented an opportunity for L.A.’s African-American Muslims to challenge and dispute that narrow perspective on their lives. It was also a chance for the community to exert agency over the way that law enforcement officers approach their work in neighborhoods where tensions between residents and the LAPD continue to run high and unresolved. “I’ve heard so many stories of kids being dehumanized by police,” Khalid Shah stated, eliciting murmurs of recognition from everyone around the table. Shah added that his decades-long history of activism has paradoxically both reinforced and softened his suspicion of the LAPD. At that point Delonte Gholston stepped in to guide the conversation. Gholston and his co-facilitator, Eddie Anderson, were fresh from their work on the Trust Talks, a series of dialogues between residents of Skid Row and the LAPD. Umar Hakim had invited Gholston and Anderson to the meeting in Inglewood to help Hakim’s team prepare to steer the event at Masjid Bilal toward practical outcomes and away from both unproductive rancor and “kumbaya”—a feel-good form of dialogue that avoids hard truths and thus fails to move the conversation forward. Anderson jumped in, lean and dapper in contrast to Gholston’s broad-shouldered casualness. With that said, Delonte wrote the words “story” and “solution” at the top of two columns on a whiteboard at the head of the table. Trauma weaved through the narratives that followed like an electrified wire. Abdul Ali, a barber who grew up in Watts, recalled the National Guard occupying his high school in the 1960s. Gerald Thompson, who came of age in South L.A. in the 1970s and 80s, recounted being hassled and even thrown against the side of a car by the police “just because I was hanging out.” Rashida Rogers, a sign-language interpreter, said she had intervened on several occasions when she witnessed LAPD officers “running up on” young people in her neighborhood. Rogers said, “I have gotten out of my car and said, ‘What’s going on?’” when she observed police intimidating children who were on their way to school. Others spoke about the importance of regular psychological evaluations for officers—especially those who have served overseas in the military—as well as the need for greater civilian oversight of the police department. In response to the latter point, Gholston mentioned Measure LL in Oakland, an initiative to create a civilian-run police commission and invest subpoena power in an agency responsible for investigating complaints of police misconduct. The measure won overwhelming support from voters when it appeared on local ballots in 2016, and Gholston believed it could be a model for similar initiatives in L.A.
Several people around the table looked dubious. Shah shrugged, conceding the complexity of the point. 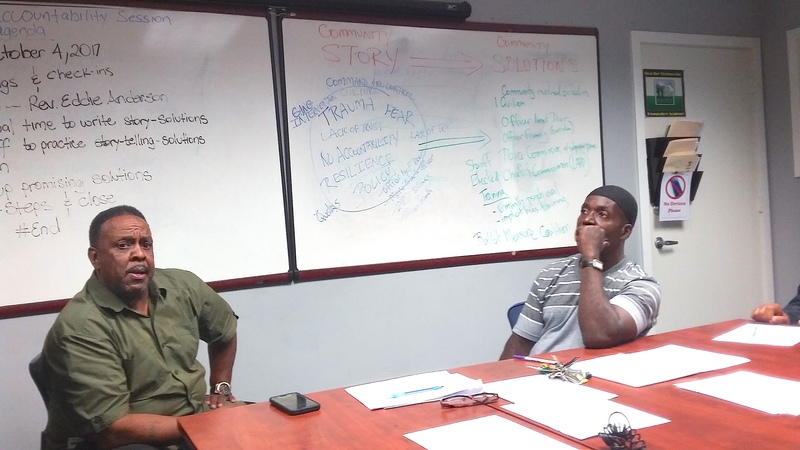 As the prep session wrapped up, participants took cellphone pictures of the stories and solutions that Gholston had written on the whiteboard. Umar Hakim hung back as everyone said their goodbyes. Hakim was also looking toward the upcoming meeting with the LAPD as a turning point. A couple of weeks later, on a warm Wednesday evening, the courtyard of Masjid Bilal—the seminal African-American mosque in Los Angeles—was abuzz with conversation. About a hundred people were divided among ten tables. 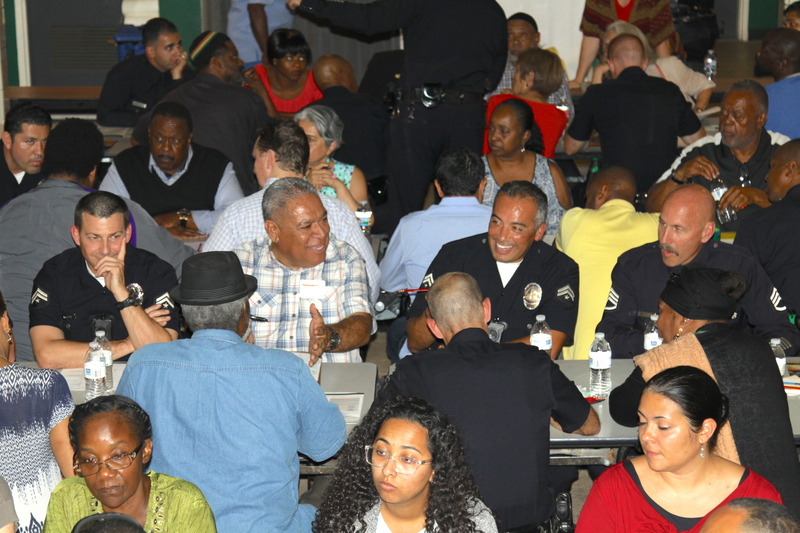 At each table there were two or three LAPD officers, a volunteer mediator from Days of Dialogue (an organization that facilitates challenging discussions between constituencies in Los Angeles) and about half a dozen members from Masjid Bilal and other predominantly African-American Muslim congregations. Participants from the prep session in Inglewood were thrown in the mix as well. Andrea Martinez Gonzalez, a mediator from the city’s Department of Consumer and Business Affairs, ended up at a table where a woman from Sub-Saharan Africa was an unexpected ally for a young white LAPD officer who looked defensive and uncomfortable. Gonzalez said that the other people at the table were polite, but kept bringing up the problems related to police violence that were plaguing their neighborhoods, as well as other communities across the country. In telling his story, the officer said people regularly shouted at him and disrespected him while he was trying to do his job—and that he was frustrated because nothing he tried seemed to diffuse those situations. She added that the officer also complained that news outlets only produce stories about what law enforcement officers do wrong. Still, she was sympathetic to the counter-narrative offered by the community members at her table. Gonzalez said that she was optimistic about the prospects for further meetings between the groups represented that night at Masjid Bilal. Officer Jim Buck, a community liaison with the LAPD’s Counter-terrorism and Special Operations Bureau who sat at a different table, echoed Gonzalez’s cautious optimism. He also knew the sources of tension in the room, along with the possibilities for progress, as well as anyone else. A decade ago, Buck was serving as a drill instructor at the Los Angeles Police Academy when the then-Chief of Police asked him to become a liaison between the LAPD and communities like Masjid Bilal. 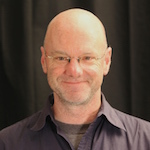 The assignment was in some ways an odd fit—Buck described himself as a “conservative Republican.” But his gregarious personality turned out to be the most important asset in his effort to allay fears and build trust among people who were wary of his intentions as a representative of a police counter-terrorism bureau. Like Gonzalez, Buck said he saw the event as the first step on a long but hopeful road. Rashida Rogers, the sign-language interpreter who attended the prep session in Inglewood, was mostly pleased with her experience at Masjid Bilal. From her perspective, the key benefit was the opportunity for members of the community to present their story in their own words and to lay the groundwork for future events that could move the conversation in a positive, evolutionary direction. She said it was the officers’ apparent willingness not just to hear, but to really accept what she was saying that left her optimistic. A few weeks after the meeting at Masjid Bilal, Umar Hakim was savoring success. The key to that positive outcome was the storytelling strategy that the prep session participants brought to the tables where they sat during the event. Hakim said he envisions future dialogues between the LAPD and the city’s Muslim communities—achieving concrete changes like the police reforms enacted through Measure LL will take sustained effort. He also wants to see meetings between community leaders and the developers who are driving gentrification in South Los Angeles, particularly around the site of Inglewood’s new football stadium. 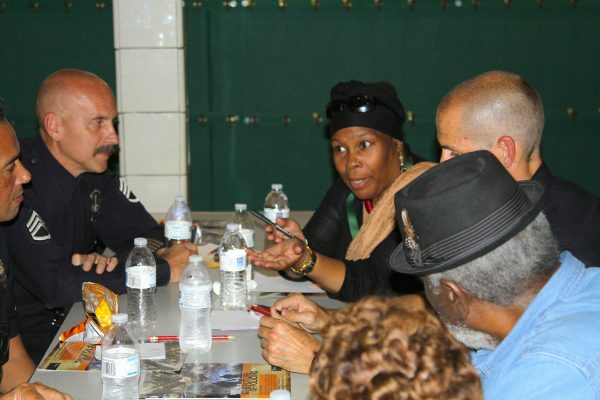 Whether it’s confronting tensions between citizens and police or managing development in a community where residents have historically been denied agency over their lives, Hakim is optimistic that the strategy that yielded signs of progress at Masjid Bilal can be replicated as a means of tackling other challenges. The Pew Research Center’s first-ever national survey of American Muslims (“Muslim Americans: Middle Class and Mostly Mainstream”), conducted in 2007, found that African-Americans account for roughly twenty percent of the total Muslim population in the U.S.
 Andrew J. Grandage, Britt S. Aliperti, and Brian N. Williams refer to this historical overlay of past practice that distorts police-citizen collaboration in the present as a “shadow effect.” See Grandage et al., “Leveraging the Intersection of Politics, Problem, and Policy in Organizational Change: An Historical Analysis of the Detroit, Los Angeles, and Atlanta Police Departments,” in James D. Ward, ed., Policing and Race in America: Economic, Political, and Social Dynamics (Lanham, MD: Lexington Books, 2018), 57. Dialogue is generally acknowledged as the key process involved in successful conflict resolution—specifically, as a prerequisite for de-essentializing the “other” and building trust between conflicting groups. See, for example, Ivana Markova and Alex Gillespie, eds., Trust and Conflict: Representation, Culture and Dialogue (New York: Routledge, 2011) and Daniel Yankelovich, The Magic of Dialogue: Transforming Conflict into Cooperation(New York: Simon and Schuster, 2001). Yvonne Yazbeck Haddad and Jane I. Smith, eds., Muslim Communities in North America (Albany: State University of New York Press, 1994), 166. Following the Rodney King beating in 1991 and the riots that followed the acquittal of the officers involved in the incident a year later, Mayor Tom Bradley formed the Christopher Commission to conduct a comprehensive assessment of the LAPD’s operations. Among other findings, the commission determined that nearly two hundred officers were implicated in repeated instances of excessive use of force. A few years later, officers in the elite Community Resources Against Street Hoodlums (CRASH) program figured prominently in the Rampart Division violence and corruption scandal. After a 12-year period of reform mandated by the U.S. Department of Justice, the LAPD was finally freed from federal oversight in 2013. See Grandage et al., “Leveraging the Intersection of Politics, Problem, and Policy in Organizational Change,” 71.